Well, it’s beginning to look a lot like Christmas! And it has been since before Halloween. It sure seems to come around fast these days. And here I am, with all the good intentions I had almost 364 days ago still in the planning stage or forgotten altogether. One of these days when we come back to December, I’ll have an advent calendar ready. Of course I guess it will just be for Alan, but I’ll still have it ready. I did that once when the kids were little. Yes, you read it right; Once. And that once they really enjoyed it. It was just a little set of cardboard drawers I'd ordered from the Current catalog. Because there were three of them I wrote little poems and clues and put those in the drawers. At a certain time they would gather, receive the clue orally, and proceed to explore until the treasures were found. I didn’t think about it making an impression, but to this day all three of them still speak of the great fun they had with that project. I saved it for next time, if that time ever comes! There was a time I had all Christmas presents purchased and sometimes even wrapped in October. Possibly there were a couple of items left but the majority of things were done. Done. DONE! I didn’t know then how good that would feel today. I have started the gift shopping but nothing is wrapped. I did stock up on bags and pre-printed boxes. I know that’s probably cheating but it’s a life saver this time of year. 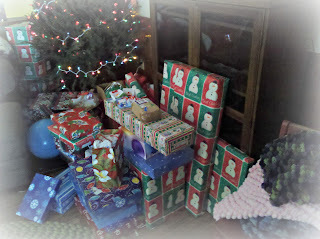 But one of these days I’ll wrap everything and have it all under the tree BEFORE anyone gets to the house. Yes, one of these days. One year all the presents were wrapped! Baking and cooking is something I like to do. It’s also something I’m good at. I don’t do anything fantastic looking like what my daughter Callye does with her cookies but at least it tastes good, regardless. Most of the time anyway! I would scour my cookbook collection looking for something easy and good to bake. I’d come up with cakes, cookies, pies and breads. And they would all be ready to sample after stepping in the door. Not now. 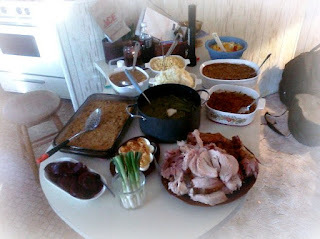 I’ll have plenty and nobody will be hungry, but it won’t be nearly the spread it has been in previous years. Maybe it will happen again, one of these days. Yum! 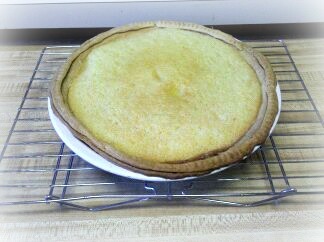 Buttermilk pie. My favorite! Dinner fit for a family! In the past I had more time. Seriously, more time off. And I had more energy to use that time in a productive manner. 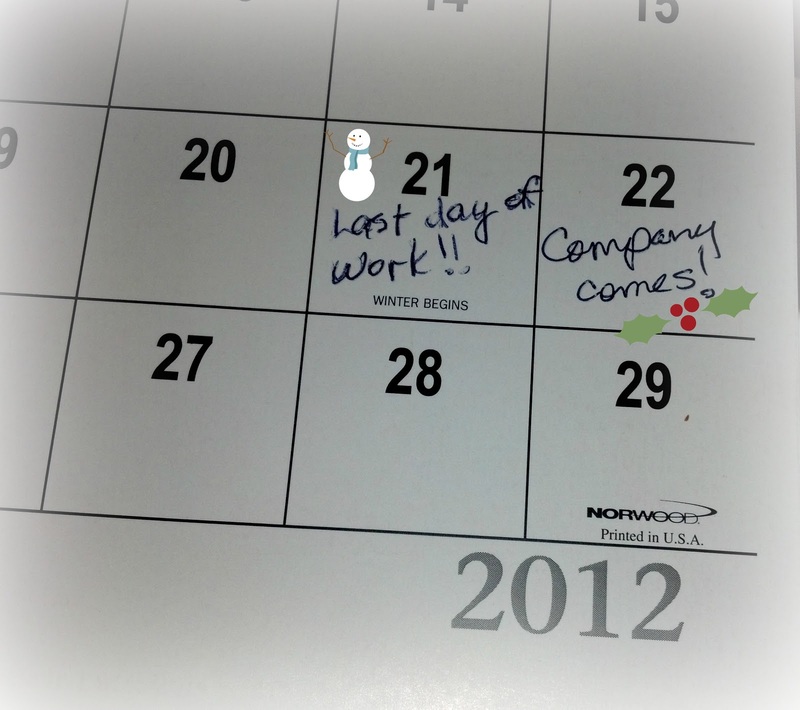 This year the last day of work before holiday break is December 21. That gives no days until the guests arrive on December 22. 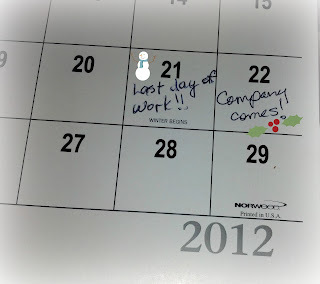 Granted, I don’t go back to work until January 3. That’s a good thing. But I could use more time up front to get things ready. Maybe, if I start planning now, I can be ready for next year. Because before you know it we’ll be back to December. I’m in an online group of knitters. Every year we have a Secret Santa exchange. It’s so much fun! 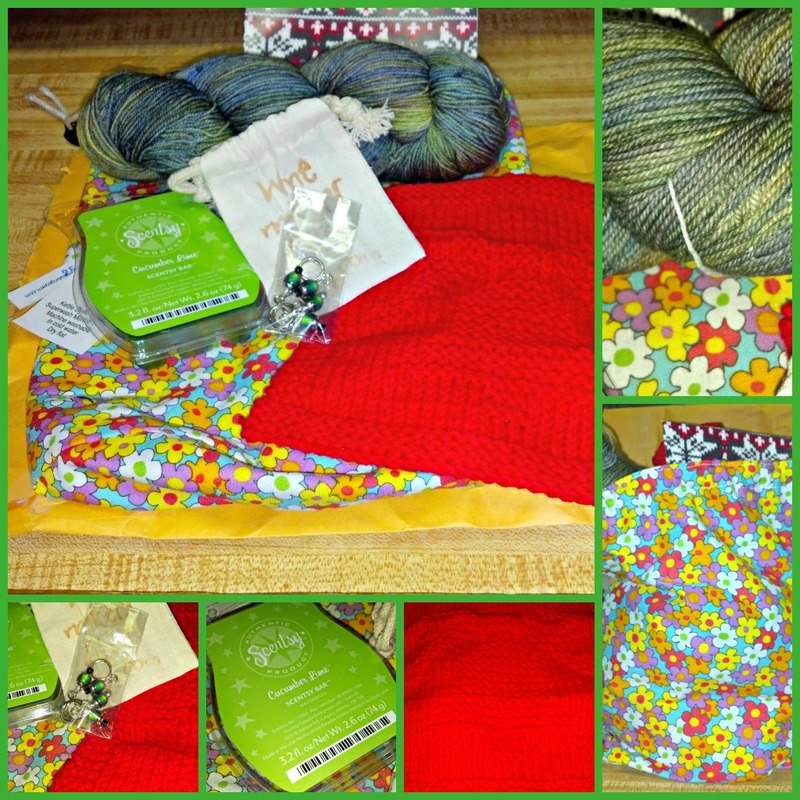 This year I got a wonderful package from mine, Carrie. 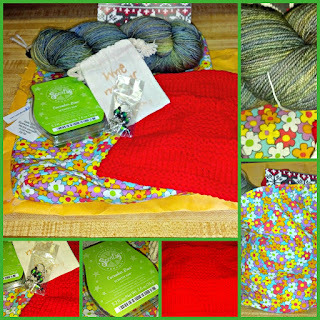 She loaded a great project bag with yarn, stitch markers, a handmade Christmas dish cloth, and some Scentsy! A very nice December surprise indeed! I'm absolutely with you! i have bought four presents, made two more but have so many more to buy and two more to knit! And I haven't even bought Christmas cards. I was going to make them but now I'm not and there may not even be any in the shops. But still Christmas will come there will be a tree in the sitting room and a turkey on the table - just! You're exactly right! We seem to always come through! Celebrating in a multi-cultural family we have more holidays than most. But I attempt to go small and shop all year round. I suppose it helps that some members of the family think holidays belong to the under 18 crowd. But even so I choose not to go into dept because of gift giving. To all what ever holidays you celebrate - enjoy the light and joy brought forth. Cheers. It's the thought that counts! Enjoy the family time!